Extreme variations in the Earth’s climate have radically changed the ecosystems, economics, cultural practices, language, and lifeways of the Indigenous groups in the Western North Pacific, including the Chamorro and Carolinian peoples who live in the Commonwealth of Northern Mariana Islands (CNMI). 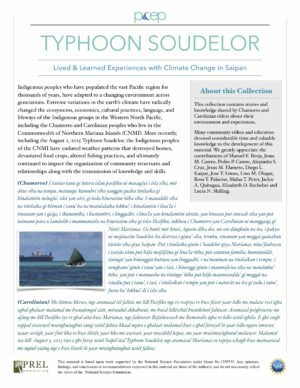 On August 2, 2015, Typhoon Soudelor struck CNMI and the Indigenous peoples of the CNMI have continued to endure weather patterns that destroyed homes, devastated food crops, altered fishing practices, and ultimately continued to impact the organization of community structures and relationships along with the transmission of knowledge and skills. This collection contains stories and knowledge shared by Chamorro and Carolinian elders about their environment and experiences around Typhoon Soudelor. The activities and materials are intended to help engage students with community member knowledge related to high-impact events like Typhoon Soudelor. The activities integrate information presented by community elders with frameworks and processes formally adopted by the CNMI Public School System and already used by science teachers (NGSS), along with resources available through the NASA program Global Learning and Observation to Benefit the Environment (GLOBE). Many community elders and educators devoted considerable time and valuable knowledge to the development of this material. We greatly appreciate the contributions of Manuel F. Borja, Jesus M. Castro, Pedro P. Castro, Alejandra S. Cruz, Jesus M. Elameto, Diego L. Kaipat, Jose T. Limes, Lino M. Olopai, Rosa T. Palacios, Malua T. Peter, Jackie A. Quitugua, Elizabeth D. Rechebei and Lucia N. Shilling.